Creating single chooser intent for camera and gallery is not so trivial. Android crop activity is limited, unreliable and is internal API. Image taken by camera may be rotated. Picked image can be large and cause memory issues if loaded in full resolution. 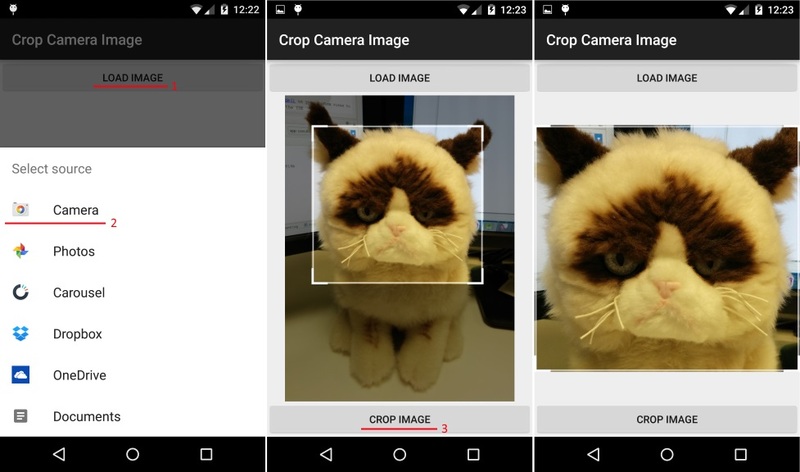 After trying cropper library, I decide to fork it, add circular crop support option inspired by another fork, fix some of the reported bugs and most importantly add support for loading image from Android URI that received from camera or gallery activity result. Same code can be used for camera and gallery source. Automatically rotate the image by exif data. Use sampling and lower density to conserve memory usage. When cropped image is requested it will again use sampling of the original image to create bitmap of the required size without loading the full image or lowering the quality of the cropped image. Check out the Gists or see the code below on how to create image source chooser Intent and use Android Image Cropper library to crop the picked image. Create Intent using getPickImageChooserIntent() that will allow to choose camera or gallery sources. Use predefined URI from getCaptureImageOutputUri() for camera source. Start activity by intent chooser. The image will be sampled to the size of the device screen with lower density. When the user finishes with cropping he/she will click on "crop" button. Retrieve the cropped image using getCroppedImage(500, 500) . The image will be sampled to the requested size. Add write external storage permissions to the manifest as some sources (DropBox, OneDrive, Etc.) use external storage to return the image resulting in “java.io.FileNotFoundException … open failed: EACCES (Permission denied)”. * On load image button click, start pick  image chooser activity. * Crop the image and set it back to the  cropping view. * All possible sources are added to the  intent chooser. // Determine Uri of camera image to  save. * Get URI to image received from capture  by camera. * Will return the correct URI for camera  and gallery image. This entry was posted in DevLife and tagged android, crop, Images. I cant reproduce the crash, can you provide the steps please, thq. How can i use a square cropShape? Hey, my work on this project was relatively minor, most of the hard work was done by edmodo. Also, I’ve started a startup firm, the reason for this blog to be silent for the past months and me not working on Android for more than 6 months. So, sorry I won’t be able to help you there. I want to crop my image using my finger in any shape irrespective of any shape of cropping.. I tried a lot to set fixed size rectangle shape but was unable to do that, Please let me know How to set fixed size rectangular cropping box? GitHub issues page is more appropriate for this question. If you want a fixed size crop window you can use min/max crop result constrains, see Limit cropped image result min max size. When I cropped image using this library the image stores on device. It should not stored image in device. 1. Get only the cropping data. 2. Not to use the activity but CropImageView directly, then you can get the bitmap object of the cropped image. But passing the bitmap data between activities is a no-go. Note, GitHub issues page is better platform for questions. And thank you for this great library, you are awesome. Dude you rock ! I’ve just used your ImageCropper lib. It is very well done, very well documented and does what I expected it to do. This is a rare thing. Thanx so much for what you’ve done (saved me ALOT of time !) and keep the great work up !